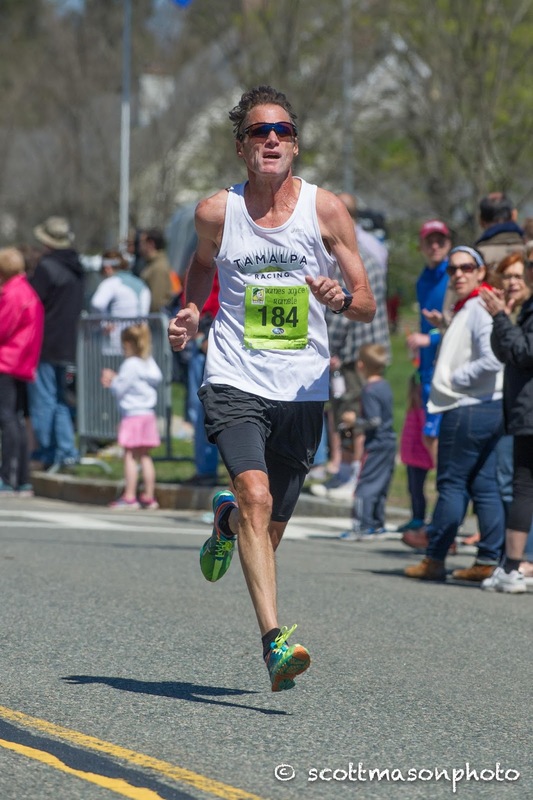 DEDHAM Massachusetts—This past Sunday, April 24th, nearly 200 of the fastest Masters Long Distance Runners in the country competed for $10,000 in prize money at the USATF Masters 10K Championship in the 33rd running of the James Joyce Ramble. Near perfect weather, blue skies and low 50 degree weather greeted the runners. There was a worry that the wind at 8-10 miles per hour might cause trouble but in the end it did not become a major factor. Defending champions were sometimes crowned and sometimes overturned by a spirited challenge. Just a reminder, as we celebrate the outstanding races at Dedham, the next USATF Road Race up is the Half Marathon Championship at the Rock n Roll San Diego Half Marathon on Sunday, June 5 2016. Men. In my preview I mentioned Dave DeChellis and Kent Lemme, the 2nd and 3rd place finishers from last year; and a number of racers who could challenge like Christopher Magill, and Peter Hammer of the Boston Athletic Association (B.A.A.) and Danny Goodman, Jr. from Florida and Aaron Totten-Lancaster of the Atlanta track Club. In the end I went with Mike McManus, the Cross Country whiz from last fall, DeChellis, and Goodman. As it turned out, McManus did not make the trip. I did not mention Mark Andrews, one of the late entrants, because it is tough to be sure which ‘Mark Andrews’ you are finding at Athlinks, especially if you are in a hurry. I found a slow Mark Andrews, aged 47, and thought that was my man but I missed that there was a 45 year old ‘Mark Andrews’ with a scorching good race time. Anyway, Andrews came in under my radar but quickly established himself once the gun sounded. 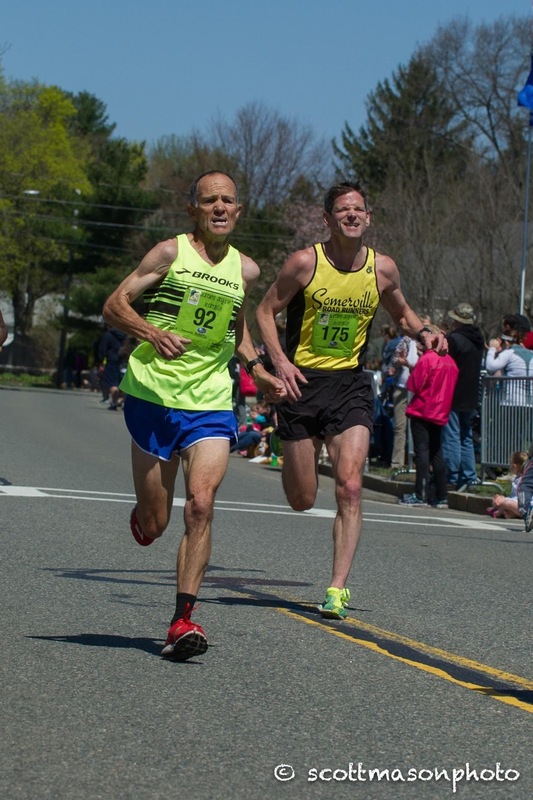 I should also have mentioned Greg Putnam of the Central Mass Striders who finished 12th last year. He was either off his game at last year’s race or his fitness has improved. Totten-Lancaster, with blue sunglasses adding color to the event, bolted to the front with Andrews and the other contenders in hot pursuit. 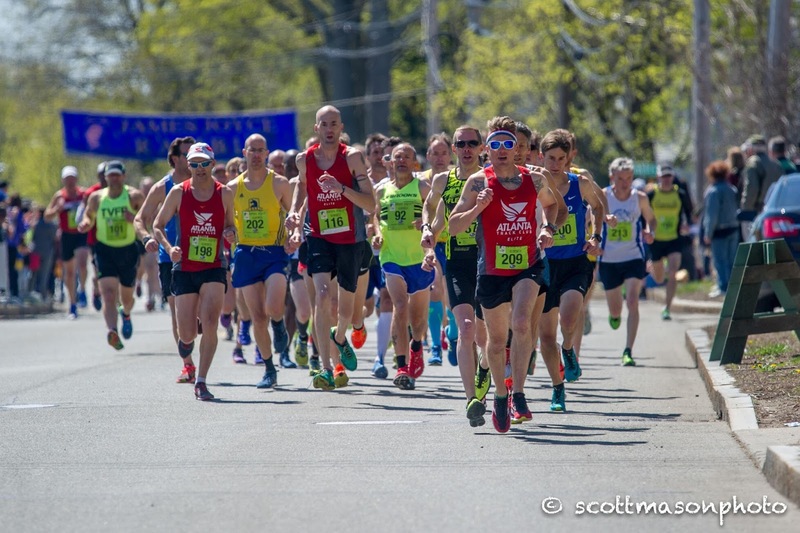 By the time they made the first turn just before the 1 mile mark, there were still a dozen runners in the lead pack, including Totten-Lancasters and Andrews, Kent Lemme, the B.A.A.’s Hammer, Gardiner, Stants and Magill; and Goodman and Putnam. By the time they came out of the neighborhoods and were running downhill between miles 2 and 3 it was clear that DeChellis, Lemme, Magill, Stants and Goodman were all being dropped. A 5-man pack of Totten-Lancaster, Andrews, Hammer, Gardiner, and Putnam made their way up the first hill in the Noble and Greenough School grounds. Once they hit the 2nd, longer hill, Andrews threw in a surge which dropped Totten-Lancaster and Gardiner. Carrying it over the top and on down, he was able to drop the other two to establish a gap. But Hammer never allowed the gap to build to much more than 20 meters. And by the time they came through the Village center with just over a mile to go, Hammer was right on Andrews’s heels. Hammer made his move when they hit the last turn with about 3/4ths of a mile to go. Andrews said, after the race, that he assumed Hammer was a 40 year old who was going to smoke him over the last part of the course; when he saw Hammer’s M45, he knew they were in the same age group. Whether that gave Andrews extra confidence that he could stick with Hammer or whether it was the thought of not only losing the overall win but not even getting the age group win, we will never know. In any case, Andrews accelerated to match Hammer. When they passed the last, short dip in the course before the final slope up to the finish, Andrews made a decisive move, got two strides on Hammer and made it stick all the way to the finish line. In the end, Andrews 32:45 and Hammer 32:47-Phew, one heck of a race! Andy Gardiner, 50 years young, made a last push to catch Greg Putnam, age 46, but couldn’t do it this day and had to settle for an age group win and 4th place overall. Putnam took 3rd in 33:08, a minute and a half faster than his 2015 time, with Gardiner only 4 seconds back. Totten-Lancaster came in ten seconds later to finish out the top 5. Andrews 32:45, Hammer 32:47, Putnam 33:08. Women. I suppose you thought the Men’s race was close? The Women’s race was even closer! In the preview I highlighted defending champions, Marisa Sutera Strange and track standout, Sonja Friend-Uhl as the co-favorites with last year’s bronze medalist, Renee Tolan, picked to repeat. I identified Nicole Hagobian, who took 3rd at the USATF 8K Championship in Brea, and Diana Bowser, who ran a 17:51 5K at the An Ras Mor race in Somerville Mass., as possible threats. Holly Ortlund, who was picked for a podium finish, was not able to compete due to a stress fracture. Strange and Friend-Uhl ran at the front the whole race. Strange used the endurance runner’s tactic of surging about 60% through the race to try to put a large gap on a speedster. That way the faster runner will not be close enough to use their blistering kick in the last 200 meters. It does not often work on the track but seems to work more often on the roads. After Strange established the gap, Friend-Uhl gradually closed over the final 3/4ths of a mile but Strange stayed strong and in the end had a one second victory in 36:48. Marisa Sutera Strange Defends her Championship in Style! Friend-Uhl was philosophical after the race noting that she and Strange are good friends. Although they live hundreds of miles apart, they chat frequently. This is Friend-Uhl’s 2nd dynamite 10K road race in the last six months, but the distance is at the very top end of her comfort zone. The 2016 Indoor 800 Meter Champion noted, with a smile, "It’s back to the track now.” Strange, the 2015 W50 Runner of the Year, ran her usual, terrific, gritty race, adding to her titles and her accolades. Renee Tolan also ran a fine race, dropping her time from last year by almost 50 seconds, to take the bronze medal overall in 37:11. Lisa Lucas tried to close over the last mile but was too far back; she finished just off the podium in 4th in 37:35. Nicole Hagobian came all the way from San Luis Obispo CA to try to match her bronze medal finish at the 8K in Brea but it was not her day as she rounded out the top 5 in 38:05. What terrific, stirring races—amazing! Strange 36:48, Friend-Uhl 36:49, Tolan 37:11. Women. Jan Holmquist has been at the top of the Age-Grading charts the last couple of years but came in battling a few injuries. Of course even when she is not at her best, she made the podium. 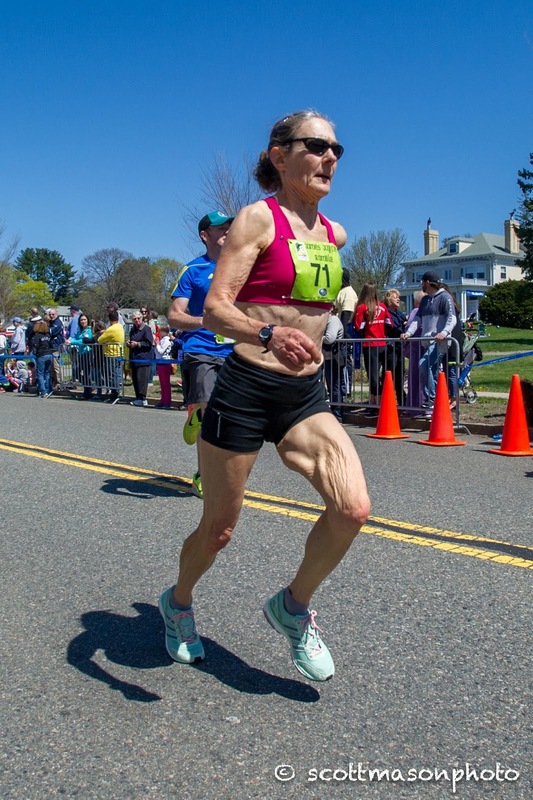 Marisa Sutera Strange, 52, added the Age-Grading crown to her overall crown as her fabulous time, 12 seconds faster than last year, age-graded at 95.44%. 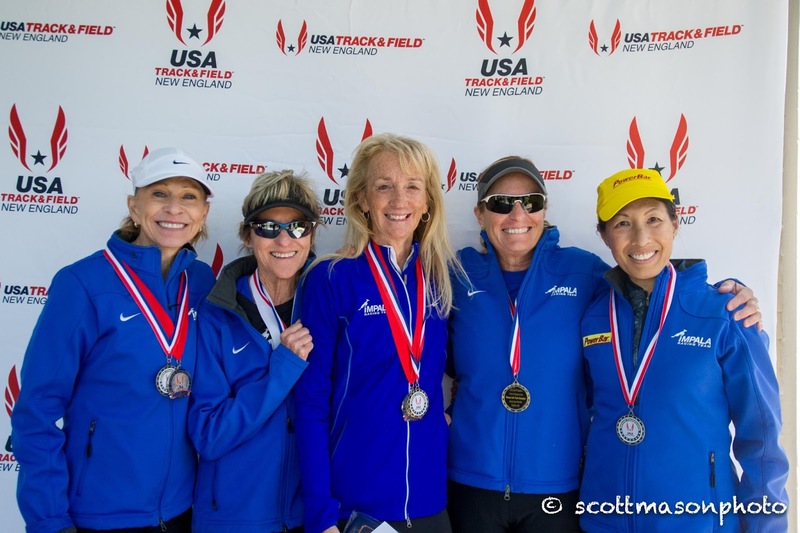 Edie Stevenson, 66, was not able to take a 2nd age-grading gold in a row, but Gold at the USATF 8K and Silver at the USATF 10K is not a bad series. Her winning time in W65 age graded to 93.73%. The remarkable Holmquist came next at 93.38%. Strange 95.44, Stevenson 93.73, Holmquist 93.38. This race, like some others, combines the Women and Men in Age-Grading in order to determine prizes. I report Women and Men separately in age-grading. Men. The Comeback Kid, Brian Pilcher, 59, topped the charts again this year with a 92.86%. As with last year, Pilcher is coming off an injury-plagued season. It clearly takes a lot to keep Pilcher off the top of the age-grading charts! 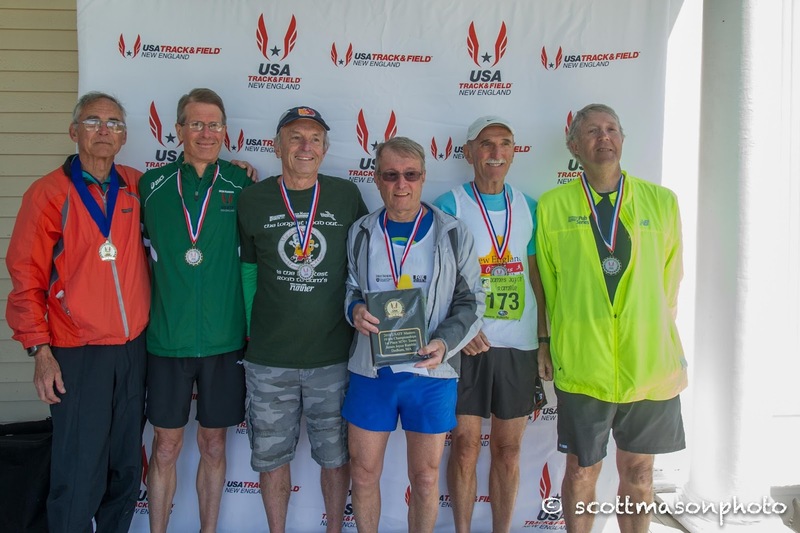 Nat Larson made his first splash on the USATF Masters stage last year at this race when he finished 3rd in M50 and age-graded at 86.57. Later in the fall he had terrific races at the 5K and 15K championships. This is his first USATF race this year, now a member of the Greater Springfield Harriers, he is definitely going for more. He improved his time by a minute and a half, raising his age-grading score to 91.04, 2nd best among the men. Rick Becker came out from Selah Washington to try his luck at the 10K, in part because he will be too busy in the fall to make many USATF Championships; he coaches a High School Cross Country team. 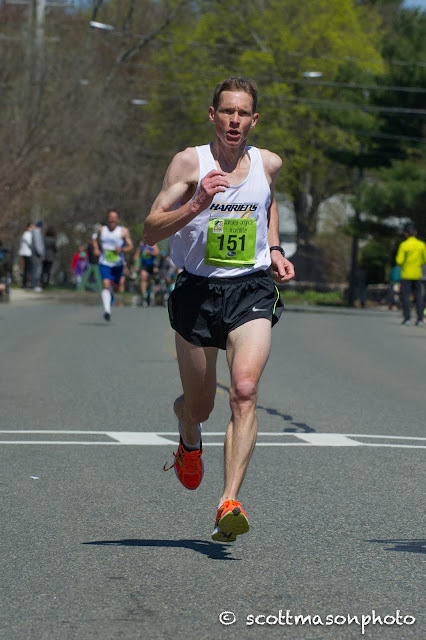 He took the top age-grading place at the USATF Cross Country Championships in Bend Oregon, the second place in the USATF 8K at Brea California and now finishing third among the men at the 10K here in Dedham with a score of 90.93. Lisa Lucas and Nancy Stewart came in 4th and 5th overall among the women with scores of 91.18 and 91.06. Peter Hammer and Mark Reeder were 4th and 5th among the men with 90.85 and 90. 55. Pilcher 92.86, Larson 91.04, Becker 90.93. W40 As Ortlund was out with a stress fracture, moving down the line, Tolan becomes the pre-race favorite, with Bowser 2nd and Hagobian 3rd. That view was partially correct. The bronze medalist, overall, Renee Tolan, was the W40 gold medalist with a comfortable margin of nearly a minute. But Hagobian, the overall bronze medalist from Brea, had too much for local favorite Diana Bowser, taking the W40 silver medal by 11 seconds. Tammie Robie, from New Hampshire, was 9 seconds back in 4th. Tolan 37:11, Hagobian 38:05, Bowser 38:16. W45 The preview saw Sonja Friend-Uhl as the prohibitive favorite, with Emily Bryans a clear 2nd based on her USATF 5K 18:37 last fall and a 38:19 10K in November 36:49. Dana Parrot’s 20:57 at the An Ras Mor 5K in March made her the favorite for 3rd. Others thought to contend included Ruthie Ireland and Kate Queeney. Friend-Uhl, of course, had no trouble, taking the division by over 2 minutes; Bryans also had no trouble, taking silver with a 2 minute margin over Parrot who took the bronze medal. Ireland was 2 minutes back in 4th. Friend-Uhl 36:49, Bryans 39:24, Parrot 41:24. W50 Marisa Sutera Strange was the clear favorite. 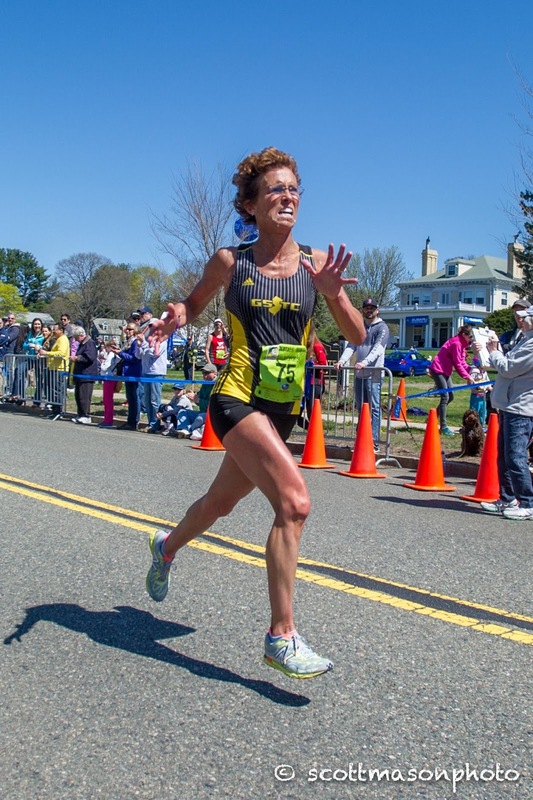 Laurel Park appeared to be the second favorite based on her winning the 2015 USATF 12K in Alexandria 36:48. Mimi Fallon won the W45 division at the 2015 10K in 38:18 so was slotted for 3rd. Janice Rempe, Kim Ionta, and Mary Zengo were tabbed as possibly factoring in. But I missed a late entrant, Lisa Lucas of Pittsburgh. I confused her with another Lisa Lucas and missed her. As soon as I saw her name in the results, I thought to myself, that’s right, she was the surprise (to me) winner of the 2015 W45 Runner of the Year award. [Whoops!] Strange won the division but Lucas was less than a minute back, establishing herself as a future contender in this division. I was right about the next two being Park and Fallon but got the order wrong. Fallon picked up the bronze medal, 15 seconds ahead of Park. Strange 36:48, Lucas 37:35, Fallon 39:01. W55 Beth Stalker’s recent 20-21 minute 5K’s and 41-43 minute 10K’s led me to install her as the favorite. Mary Sweeney, the silver medalist at the Tulsa 15K last October, was 2nd favorite, with Nancy Briskie favored for 3rd based on her 5K times late last year. I tabbed Karen LaVerdiere and Colleen Magnusen as two who might factor should any of those falter. As it turned out, none of them did. Stalker and Sweeney had quite a battle though but in the end Stalker held a six second advantage as she took the W55 crown. Briskie ran well but could not keep close to those two as she claimed 3rd in 45:22, two minutes ahead of LaVerdiere. Stalker 41:42, Sweeney 41:48, Briskie 45:22. W60 The preview identified Mo Bartley and Nancy Stewart’s best time as being within 1 second of one another, 41:58 and 41:57 respectively. 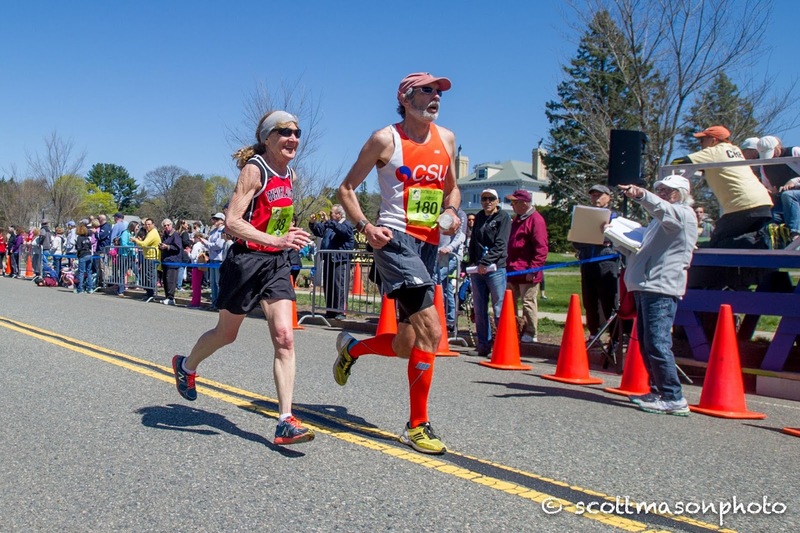 I gave Bartley some extra credit for having finished 2nd to Kathy Martin at the 2015 Club Cross Country Championships, installing her as the favorite over Stewart. I identified Alda Cossi, Sidney Letendre, and Jill Miller-Robinett as the contenders for the 3rd spot. There, again, I gave Miller-Robinett the edge because of her greater experience at national championship events. Bartley and Stewart justified the pick but reversed the order. On this day, Stewart was too strong for Bartley, working to establish a large gap through the middle of the race. Bartley could not catch up with her as Stewart came across the line in 42:42. Bartley was 2 minutes back in 2nd place with a significant gap back to 3rd place. There, too, I had the order wrong as Letendre edged Miller-Robinette for 3rd. Stewart 42:42, Bartley 44:45, Letendre 46:21. W65 This division turned out pretty close to the way I called it. Edie Stevenson had a strong win in 45:08, which she characterized as an ‘okay’ day. A little over three minutes back Mary Sharkey and Jo Anne Rowland were having quite the duel. I figured it to be close between them; Sharkey’s 38:13 5-mile mark is just slightly better than Rowland’s 8K [4.97 miles] mark, and maybe that should have tipped me off. Despite Rowland’s best efforts, Sharkey was able to carve out a lead which Rowland could not eliminate. Sharkey took second, ten seconds in front of Rowland. Stevenson 45:08, Sharkey 48:38, Rowland 48:48. W70 Jan Holmquist and Dianne Anderson had this race to themselves. As I wrote in the preview the main question was whether Holmquist would be able to lower her American record from the time she established last year at this race, 45:22. Holmquist had been dealing with some minor nagging injuries coming into the race so a record was not one of her goals; finishing without aggravating anything , finishing toward the top of the Age-Grading, and getting another gold medal were. She accomplished all of that, winning the W70 gold medal in a time that pales next to her usual accomplishments but would be absolutely terrific for anyone else. Anderson took second; her time suggests she may have been dealing with some niggling injuries as well as it is well off her pace earlier this year in the 8K at Brea. Holmquist 45:22, Anderson 1:12:04. M45 As the entire podium for the Overall Race came out of this division there is no need to repeat that analysis. Mark Andrews 32:45; Peter Hammer 32:47, Greg Putnam 33:08. M50 The B.A.A.’s Andy Gardiner was in the hunt for the Overall win through the halfway point and still had his sights on the podium until the last 200 meters when Putnam pulled away to take the bronze medal. M50 gold is some consolation though. I had Mike McManus picked for 2nd; his absence meant Nat Larson’s projection for 3rd becomes 2nd and Francis Burdett, Larson’s teammate, picked for 3rd, with Pete Bottomley and Daniel Verrington identified as other competitors who might factor in. Gardiner, of course, is the winner in 33:12, with Larson kicking it in less than a minute back under 34 minutes-another terrific race for the pride of Amherst MA. His teammate, Burdett, was able to hang with Larson in the early stages of the race and then stay tough in the middle portion of the race to remain well clear of Verrington and Bottomley who finished in 4th and 5th a minute and change back. Gardiner 33:12; Larson 33:51; Burdett 34:32. M55 This division was slated to be a dust-up between 2012 and 2013 Runner of the Year, Brian Pilcher and Mark Reeder, a classic West Coast/East Coast battle. Just like last year, Pilcher is coming off an injury rehab year. In 2014 he lost the first half of the year and gradually improved his times through the fall. When he ran a 1:14:50 at the Kaiser Permanente Half Marathon in early February 2015 and took 1st at the USATF 8K Championship in late February it looked like Pilcher was back. But maybe not quite all the way back. In any case, Pilcher and Reeder had a beauty of a race in Dedham last year with Reeder taking M55 first in 34:36 to Pilcher’s 35:07. It looked like the start of another fine racing year for Pilcher but when he went over to Lyons France to compete in the World TF Championships he sent the bad news back that he had blown out his hamstring. He did not race again that year. It was time for another comeback. He ran the USATF 8K again, taking the M55 2nd in 28:50. It was humid and many runners recorded times that were a half minute to a minute slower than in 2015. But it looked like Pilcher would have a tough time taking Reeder in their rematch if Reeder’s fitness was up to snuff. Jeff Dundas, who ran a super 35:47 at the Crescent City Classic 10K looked to be a sure thing for third, with Michael Gorriaran and Michael Anderson just off the podium. Unfortunately Dundas, though starting off well, developed a lower gluteal tear during the race and wound up as a DNF. So that left Anderson and Gorriaran in a battle for 3rd. The duel between Pilcher and Reeder was all it was cracked up to be. As Pilcher recounted after the race, it unfolded much like last year. Pilcher took the early lead until Reeder passed him around the 2 mile mark. Unlike last year, Pilcher stayed with him, tucking in out of the wind. Pilcher made a move, at mile 4, on the down slope just after the 2nd hill in the Noble and Greenough School grounds. But Reeder hung tough and retook the lead after a quarter of a mile or so. Reeder couldn’t shake Pilcher but Pilcher could not gain ground either, a terrific battle of wills all the way to the finish line, with Reeder winning by 4 seconds—much closer than last year. Like so many Masters runners, these guys like and admire each others running so it's great to see them competing at a high level. The third spot on the podium went comfortably to Gorriaran as Anderson had an off day. Reeder 34:56; Pilcher 35:00; Gorriaran 39:08. M60 Rick Becker was the favorite to repeat the division victories he earned at the Bend (8K XC) and Brea (8K road) national championship races. I would have put the adjective ‘heavy’ in front of favorite had John Barbour not been entered. He pressed Becker for all he was worth at Club Cross Country last December with Becker pulling away in the last portion of the race to win by just 6 seconds. But Becker is already battle tested at USATF Championship races while Barbour, as is common in the northeast had only run races since early march and was not as likely to be at full fitness. Last year in this same race, Reno Stirrat pushed Barbour all the way to the finish losing to him by just 4 seconds. Heath Hibbard’s fine early season work at Bend and Brea got him a mention as a threat for the podium if any of the top 3 were off their game. Becker thought the wind made the race tougher than expected but he must have been relieved to find that Barbour was not right on his heels all the way as had been the case at Club XC. Barbour’s early season fitness was no match for Becker’s, finishing a minute and a half back, but he still ran a fine time and was not pushed for 2nd. Stirrat, like so many other veteran runners has on days and off days. This day was still good enough for a bronze medal as he finished 23 seconds behind Barbour. Hibbard was just off the podium, 20 seconds behind Stirrat. Becker 36:24; Barbour 38:06; Stirrat 38:19. M65 This division went from being a ‘walk in the park’ for Hall of Famer Doug Bell to being a very tough field when Doug Winn and Bill Dixon entered in the final week. Winn had a fine win in this division in the crowded field at the Club Cross Country championships in December, beating Dixon by 17 seconds, and added a win at the USATF XC at Bend OR this February. Dixon beat bell by 7 seconds in the 5K championship at Syracuse last October. Peter Mullin, the outstanding runner from Houston TX, has had a good start to the year and could certainly factor into the race if any of the top 3 faltered. So it looked to be a tight contest. And it was. Bell went out fast, passing the 1 mile mark in under 6 minutes. Winn bided his time and passed at the final turn a little less than a mile from the finish. He went by with a full head of steam and Bell could not respond. Bell is a tough runner though and did not fade; he was able to take 2nd with a 46 second margin. To my surprise, it was not Dixon in 3rd though, but Mullin. Whether that is because Dixon was slightly off, or because Mullin is regaining the fitness he enjoyed a couple of years ago remains to be seen. Or it may be a combination. Certainly Mullin finished much closer to Bell in this race than he did in the8K championship race at the end of February in Brea. It will be interesting to see if he can continue coming toward the front and tighten up future M65 contests. Winn 38:24; Bell 38:56; Mullin 39:42. M70 In my preview I suggested this would be a 4-man race, between 2015 M70 Runner of the Year, Jan Frisby, Gary Patton, the excellent middle distance runner on the track, victor at Ben and 2nd at Brea, Przemek Nowicki, who captured M70 gold in the last 2 road races of 2015, and yours truly, Paul Carlin, who has been on the comeback trail and had not won a national championship race since the Half Marathon in February 2014 and who had finished right behind Nowicki at his 2 victories in the fall and right behind Patton at Bend and Brea. Frisby had sustained an Achilles injury at Syracuse last year and did not compete after that until the Brea race this February. As he was well off his fitness then it seemed implausible that he could improve enough in 8 weeks to contend for the podium. But I knew he would not be far off. Uncharacteristically, Carlin went off relatively fast. He learned later that Nowicki had tried to stay with him but felt that had been a mistake. Nowicki says the first kilometer was in 4:01 so he eased off then, but still passed the first mile in 6:46. Patton laid off a bit more, knowing he always had his strong finishing speed to help, as long as he was close. Nowicki saw Patton go by with a smooth and light stride at around the 3 mile mark and decided to let him go and concentrate on nailing down 3rd. Frisby had apparently been moving up steadily and came even with Nowicki at the 4 mile mark. But at that point the remaining gaps in Frisby’s fitness asserted themselves and Nowicki started to pull away. I ran scared all the way to the finish line. Nowicki had passed me in the final 300 meters in Tulsa last Halloween; Patton had passed me in the last 200 meters in Brea. I did not want it to happen again---and it didn’t! Patton indicated that he was nearly two blocks back when I finished and because of the curvature of the road and the final slope up, he never saw me. Lucky for me because if Patton had seen me, my goose might have been cooked! Even though Patton had to settle for 2nd he had a 2 minute gap on Nowicki. Frisby finished just off the podium, 21 seconds back. I learned after the race that Frisby tweaked his Achilles tendon again but it appears to be only a minor setback. Carlin 42:22; Patton 43:06; Nowicki 45:19. M75 Based on recent race times, I had Ron Mastin picked as a close winner over Harry Carter but thought it might well be a tight race. I had Matt Lalumia as the favorite for the final podium spot based on his steady racing last fall at Syracuse and Saratoga Springs. Andrew Sherwood and Al Swan were pegged as possible threats should any of the top 3 falter. As it turned out, Mastin enjoyed a greater margin of victory than I had anticipated, defeating Carter by over 2 minutes. Lalumia provided his usual steady run and took 3rd easily, 3 minutes back from Carter. Sherwood finished in 4th, four minutes and change behind Lalumia. Mastin 49:44; Carter 51:51; Lalumia 55:05. M80 The number of contestants for this division quadrupled from 1 to 4 in a year’s time. I pegged Bill Spencer as the favorite based on strong sub-25 minute 5K’s. Because he runs few races beyond 5K, I worried that Jim Askew who had run more 10K’s might give Spencer a run for his money, despite slower 5K times. It looked like defending champion, Lawrence Cole, would have his hands full with Jon Desenberg who would challenge for the last podium spot. Spencer was up to the longer distance, taking the crown by over 5 minutes. Askew came home 2nd in a good time, cracking the 1 hour barrier and defeating the bronze medalist, Desenberg by more than 10 minutes. Cole finished just off the podium, 4 minutes back from Desenberg. Spencer 53:51; Askew 59:03; Desenberg 1:10:28. M40+: Last year Kristian Blaich led the Atlanta Track Club to victory with the Central Mass Striders and the Boston Athletic Association (B.A.A.) 2nd and 3rd. This year was the B.A.A.’s turn to shine. They sent a terrific team and cleaned up, with talent up front and plenty of depth, and they delivered. Peter Hammer led the way with his 32:47. Andy Gardiner was, similarly the first team #2 to finish at 33:12 and Harry Stants was the first #3 runner in for any team at 33:50. Having Chris Magill as your 4th runner defines depth. The B.A.A. won by nearly 3 minutes. The contest between the Striders and Atlanta was similarly well defined with each runner on Central Mass coming in anywhere from 14 seconds to nearly a minute ahead of his counterpart on the Atlanta team. B.A.A. [P. Hammer, A, Gardiner, H. Stants, C. Magill, M. Herman] 1:39:49 [average=33:17]; Central Mass Striders [G. Putnam, T. Van Orden, J. Perks, J. shairs, D. Verrington] 1:42:40 [34:14]; Atlanta TC [A. Totten-Lancaster, B. Slavens, B. Fields, M. Whitis] 1:44:53 [34:58]. W40+: Last year it was the Dirigo RC, from Maine, that won big, with the Greater Lowell Road Runners and the Genesee Valley Harriers [GVH] slugging it out for 2nd and 3rd with only 9 seconds between them at the end. This year it looked like the Atlanta TC would win it by a mile with the team they were sending but Holly Ortlund, their #2 runner, sustained a stress fracture in her foot a few days before the race. 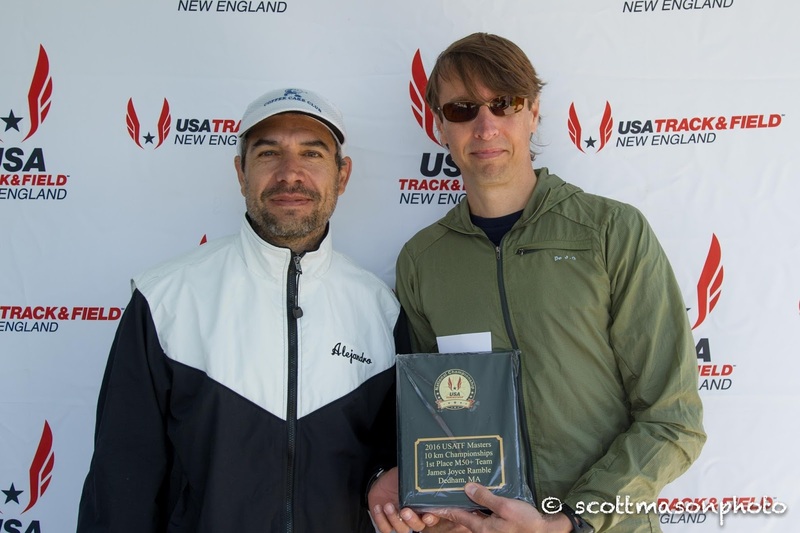 They were still the favorites but the Western mass Distance Project had visions of possible gold. 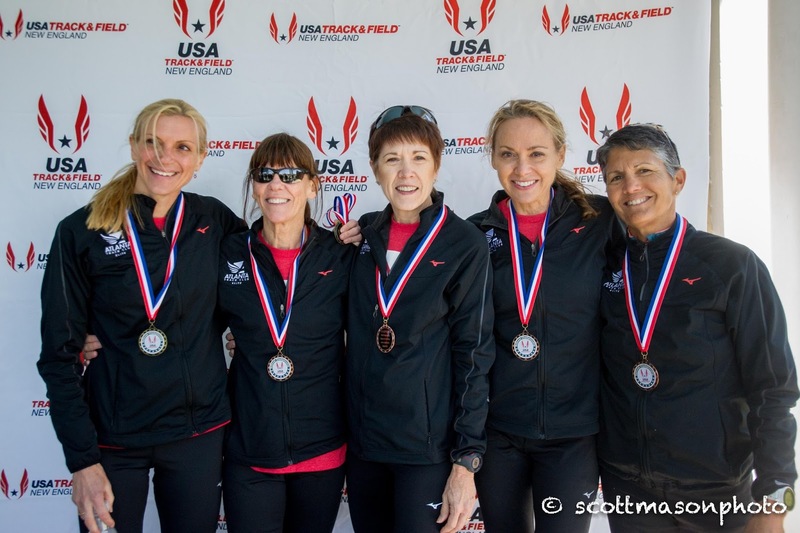 In the end, Sonja Friend-Uhl’s strong 36:49 gave Atlanta nearly a 5 minute lead over Western Mass, and their new #2, 60 year old Nancy Stewart, padded the lead slightly so that even though they lost a little ground with their 3rd runner, Atlanta took the gold with nearly a 2 minute margin. GVH was not close but they were well ahead fo the Greater Lowell team to capture the 3rd spot on the podium. Atlanta TC [S. Friend-Uhl, N. Stewart, S. Whitis] 2:06:27 [42:09]; Western Mass Distance Project [D. Parrot, R. Ireland, S. Dolven, K. Queeney] 2:08:12 [42:44]; Genesee Valley Harriers [W. Tyler, M. Senall, G. Geiger] 2:15:43 [45:15]. M50+: The Atlanta TC and GVH battled for the top spot with Atlanta in front by less than a minute when all runners were in. The GVH ‘B’ team took 3rd and the Greater Springfield Harriers [GSH], even though they had one of the top runners in the division, Francis Burdett, did not even field a team in this division. What a difference a year makes! GSH recruited Nat Larson who ran as an independent last year and fielded a heck of a team this year. Larson led the way for the win, beating the #1 runners of reach of their closest competitors by over 2 minutes. Burdett, their #2, beat his counterparts by nearly 3 minutes, and Ron Lombardi turned in a similar performance, beating the #3 runners on other teams by 90 seconds or more. GVH had enough for 2nd though as Mike Nier, though coming off injury, ran a gritty race in 1st, helped tremendously by their #2 and # runners, Dale Flanders and Theodor Schnaufer, who bested their #2 and 3 counterparts on the Dirigo R.C. Greater Springfield Harriers [N. Larson, F. Burdett, R. Lombardi, A. Heuck, P. Fratinin] 1:45:01 [35:01]; Genesee Valley Harriers [M. Nier, D. Flanders, T. Schnaufer, D. Bischoff, D, Radford] 1:51:54 [37:18]; Dirigo R.C. [P. Bottomley, J. Walker, R. Chalmers.] 1:54:27 [38:09]. M60+: Last year this was a classic Northeast dust-up with teams from Massachusetts, New Jersey and New York battling for top spot on the podium. The ‘Jersey boys’ of Shore AC had it their way as they followed Reno Stirrat’s 37:05 all the way to the title, with Greater Lowell taking the silver and Genesee the bronze. 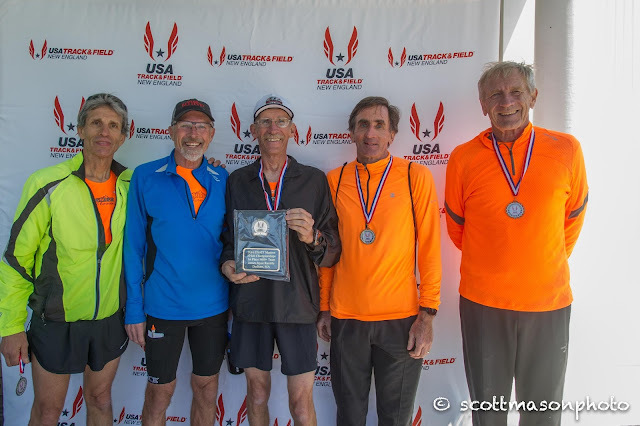 But last summer Doug Bell and Jan Frisby found some other Rocky Mountain ramblers who were willing to travel and decided to take their racing on the USATF Grand Prix road. They traveled to Flint, Syracuse and Alexandria Virginia and, at the end of the year, the Boulder Road Runners took home the Club GP banner. 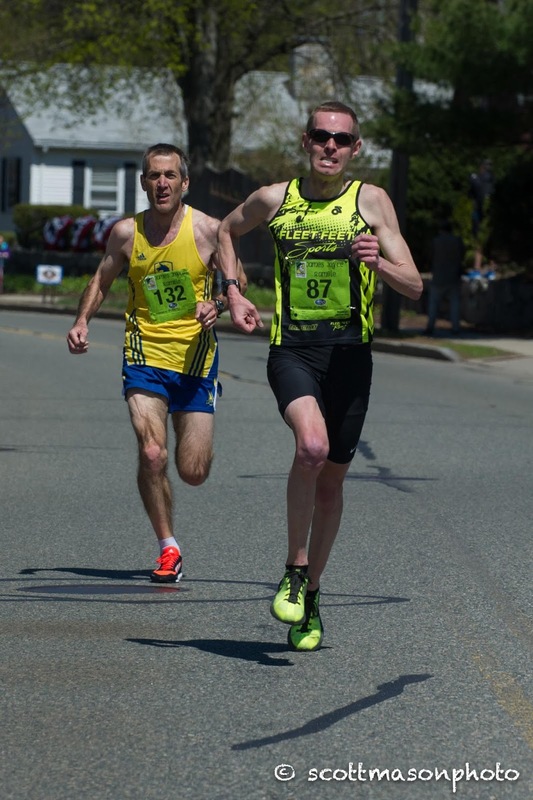 This was their first try at the 10K title in Dedham. 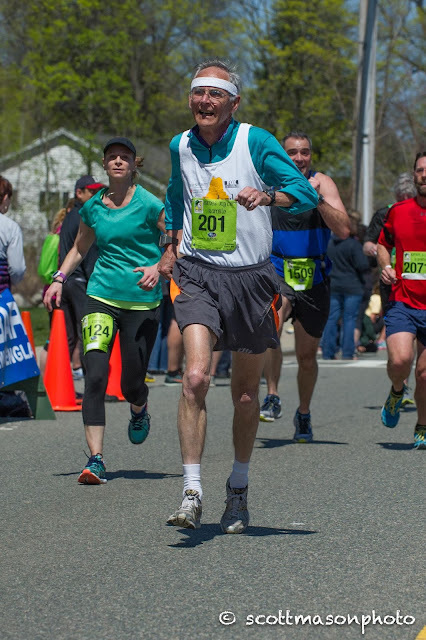 John Barbour of Greater Lowell, was first team runner across the line, followed by Stirrat, but the Boulder Road Runners had a tight pack with Heath Hibbard and Doug Bell finishing within 7 seconds of each other and Devin Croft coming in well ahead of his counterparts on Shore and Greater Lowell. Those two teams finished within a second of each other. Barbour and William Dixon gave Lowell about a minute lead but Shore’s 3rd runner, Mark Chiusano, sprinted in to give Shore AC the silver medal by a single second! Some race!! The ever reliable GVH team was a little off their game and went home in 4th. Boulder RR [H. Hibbard, D. Bell, D. Croft, M. Donelson, J. Frisby] 1:59:32 [39:51]; Shore AC [R. Stirrat, P. Gaughan, M. Chiusano, J. Kilduff] 2:01:50 [40:37]; Greater Lowell RR [J. Barbour, W. Dixon, G. Stewart, W. Mann] 2:01:51 [40:37]. W60+: In 2015 the GVH team had this division to themselves. This year the GVH team was not present. I hope this reflects a temporary setback and/or busy schedules. 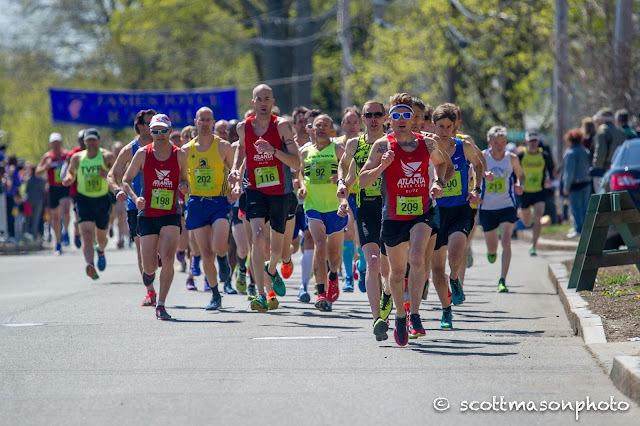 But 3 teams did contest this division, the Central Mass Striders team from the Connecticut River Valley, the Impala Racing Team from the San Francisco Bay area and the Atlanta Track Club. Impala came with their strongest, Mo Bartley, Jill Miller-Robinette , and Jo Anne Rowland. That was more than enough as their top 3 came in within 4 minutes of each other to cruise to a 9 minute victory. M70+: Two New England teams, two from New Jersey and one from Atlanta contested this division. The Shore AC team had the strongest individual runner in Przemyslaw Nowicki but the New England 65 Plus Runners Club proved to be the strongest overall as they had very strong runners and a tight pack with their top 3, Clayton Zucker, Joe Noonan, and David Pember finishing within 2 and a half minutes of each other. Shore claimed the silver medal with a comfortable margin of well over 6 minutes. Atlanta took home the bronze medal. NE 65+ RC [C. Zucker, J. Noonan, D. Pember, R. Paulsen, J. Gibbons] 2:28:07 [49:23]; Shore AC [P. Nowicki, J.L. Seymore, J. Kuhi] 2:32:51 [50:57]; Atlanta TC [R. Mastin, C. Patterson, J. Askew, A. Sherwood] 2:39:31 [53:11]. Christopher Lawrence, Andrew Spaulding, Gary Patton, Harry Stants, Ron Lombardi, Kirk Larson, Brad Slavens, Titus Mutinda, Aaron Totten-Lancaster, Christopher Magill, Mike Nier, Dave DeChellis, Gary Radford, Danny Goodman, Joe Shairs, Patrick Gaughan, John Van Kerkove, David Bischoff, Christopher Smith, Joseph O’Leary, Jan Frisby, Dale Flanders, Harry Carter, Devin Croft, Przemyslaw Nowicki, Robert Landry, Michael Anderson, Alejandro Heuck, Theodor Schnaufer, Frank Gioia, Eduardo Matsuo, Mark Donelson, Michael Gorriaran, Doc Rappole. (Rules—Top 3 runners for each complete scoring team, across age groups, in age-grading tables, score by place not %; all declared runners can displace)—Only runners on complete teams counted. Other team in contention: Liberty AC 48.